Heritage-Henredon pieces designed by Mr Wright. The question was asked, "Are the tables part of the H-H line ?" Given that the edge facet is unusually broad, and undecorated, I would have said "No." two images from Hanks' "Decorative Designs. . ."
These undecorated oak H-H pieces, apparently owned by the Foundation, could be prototypes rather than production pieces. . .? photos from "The Prairie School Tradition"
Thanks for the thread and the pictures, Stephen. 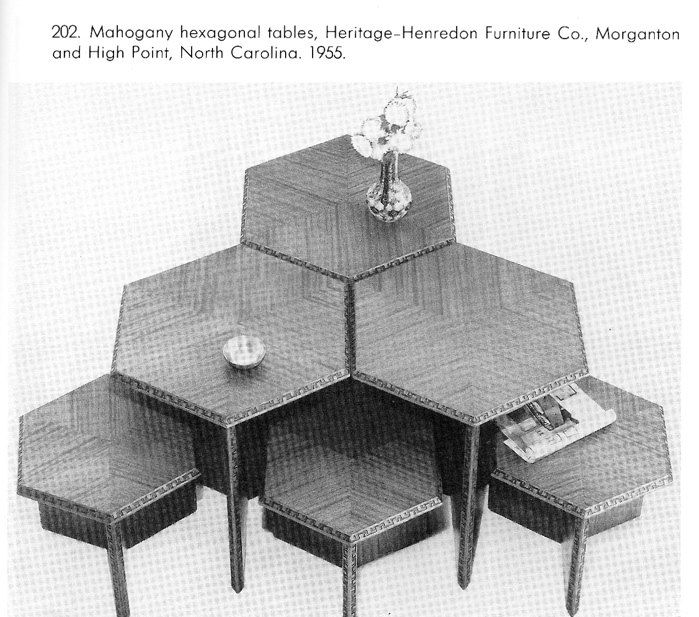 What I meant with my poorly worded question in the other thread was: I was wondering if anyone knew if the Rubin furniture designs shown in hypno's picture (hex-table and tri-seats) were then used as the basis for the HH similar line? Because they sure do look similar - except, as you have pointed out, for the edge treatment. Those undecorated pieces are a great find, too! Though I'm not sure just how comfortable that small block of wood would feel pressing into your upper back when sitting in the tall-back chair. to matter! But I take your point. pieces and could have served at their prototype, couldn't it ? It would be useful to pursue this line of inquiry. called Four Square was plain ? The canted edge of the Rubin pieces, and that of the Friedman table, apparently do not have the return bevel on the underside of the top. do. Did the H-H lines remain in production long enough for Wright to have made changes in their design ? It looks like I will have to publish some of David Hanks' text on this project. Posted: Wed Feb 25, 2009 7:16 am Post subject: H-H Furniture. 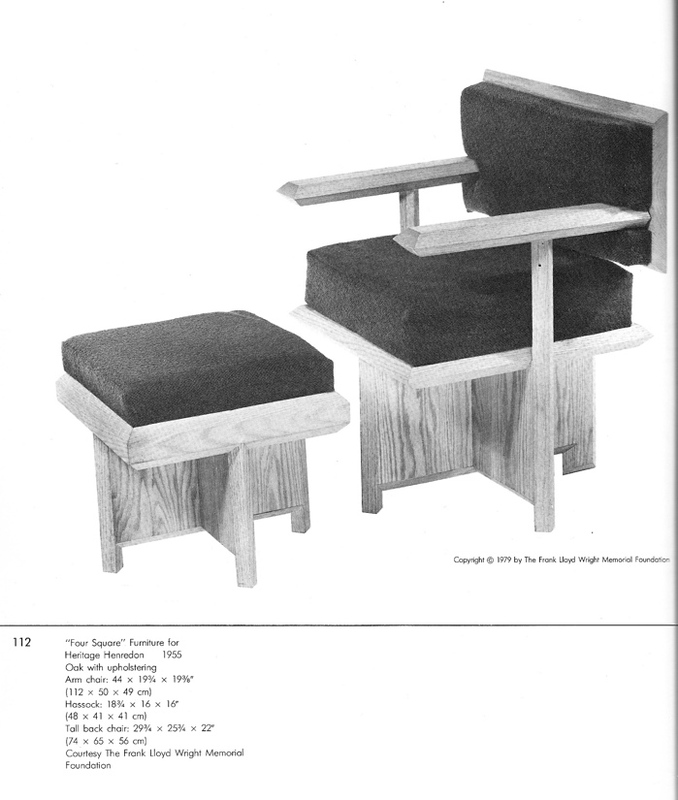 SDR:The three furniture items you show and four more were made from previously unrealized H-H drawings for a Frank Lloyd Wright exhibit at the Yellowstone Art Center, Billings,Montana in 1973. The Taliesin archives has between 80 and 100 drawings showing three lines of furniture all shown in the Hanks book in part. "The Heritage-Henredon collection of designs is a large one. These are the first designs that were associated with Wright to be produced for public consumption. There were many innovations included in the series such as table groupings, sliding tops and nested pieces in square, triangular , and circular shapes. The characteristic that wove all the pieces into a single series was the chamfered wood edge with an abstracted Greek key motif carved into the upper surface, covering the edge of the laminated wood. All of the pieces were executed in mahogany. 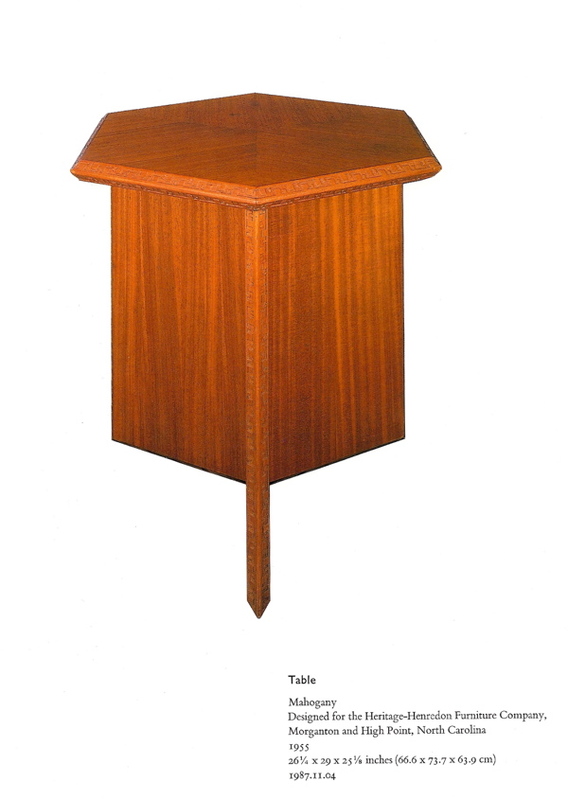 The veneers of the tops were handled artistically: hexagonal tops had triangular veneers meeting at the centre; some surfaces were bent at the end and the grain of the veneers waterfalled over the edge, along with the drop of the top. The potential arrangements of several of the small table designs were considerable. The triangular and hexagonal table, in particular, are suited to clusters and linear arrangements for storage, display and seating. 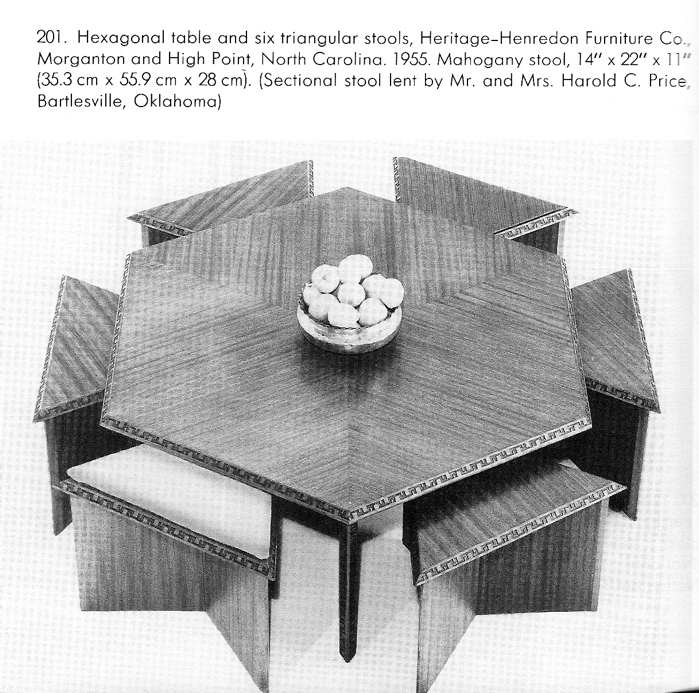 The smaller triangular and hexagonal tables are the best of this type. 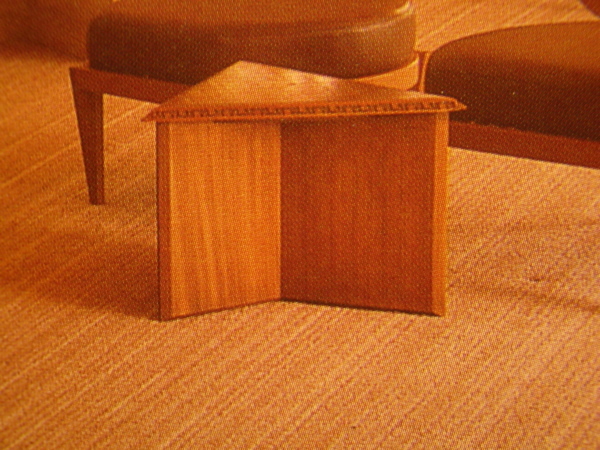 The edges of the tables adapt well to various arrangements; a fact appreciated in most of the promotional photographs taken. There are many clever details associated with this line such as the pull-out feature of the desk enabling it to be used as a typing table, and the interchangeable bases. The elimination of any hardware door or drawer pulls is a favourable factor. The cut out flush pulls are unlike the rest of his furniture, with one exception: the bedroom closet at the Little House in Wayzata, now installed in the Lovness Cottage near Minneapolis. One of the goals of this line was for the 'design to make the home more efficient as well as more beautiful'. This is the only statement associated with Wright's furniture that discussed the efficiency-increasing ability of any feature. The most distinguishing feature of the Heritage-Henredon line was that each piece is identified as a Wright design by a branded signature which was often accompanied by a red square. None of the pieces from the rest of his career is marked or identified." "The series was not financially successful, although, apparently, it did not lose money. The line was perhaps unsuccessful because people failed to associate it with Wright's usual work. The use of mahogany, the carved edge detail and the lack of spindles may have contributed to it not being accepted. Now, of course, the line is sought after, commanding ever increasing prices." "Wright originally designed three lines of furniture. They were called: 'Burberry', 'Four Square' and 'Honeycomb' and were circular, square and hexagonal respectively. The line ultimately merged into the '2,000 Series' that incorporated all three geometric shapes. There were about thirty designs in the '2,000 Series' brochure illustrating the pieces. All of the pieces were stamped with an identification mark and/or tag. 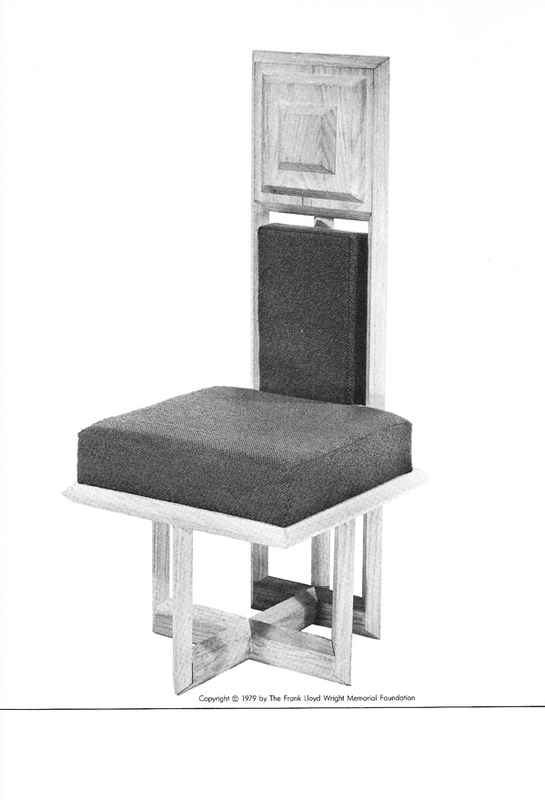 This is unlike all of Wright's other furniture which was unmarked with regard to designer, maker or year of production." (see my note above) "Elizabeth Gordon, editor of 'House Beautiful', seems to have been behind the venture to a large extent. Wright and she came together as the result of an article which she published in April 1953 entitled 'The Threat to the Next America'. In the article she warned against the 'less is more' movement which Wright responded to. She may have introduced Wright to key people at Heritage-Henredon and Schumacher, but Wright seems to have already known the President of Martin-Senour Paint Co.
And extract from the brochure read: 'Mr Wright's organic concept of design is expressed in the carved perimeter moulding detail which focuses the interest to the edges creating (as in nature) a decorative, three-dimensional outline. The ingenious handling of this moulding recalls it as part of the design and not on the design. A natural finish has been applied to the selected mahoganies to enhance the true natural beauty of the wood grain. The intrinsic beauty of the natural cleft flagstone and aged copper has also been unblemished by artificial treatment. Here is furniture with integrity of design, not pretence, furniture with innate beauty stemming from excellent relation to utility, natural use of fine materials, beautifully executed and with proportions which recognise the human scale'." I recall reading somewhere that Wright was not very enthusiastic about the HH venture and actually subordinated some of the designs to a few apprentices. 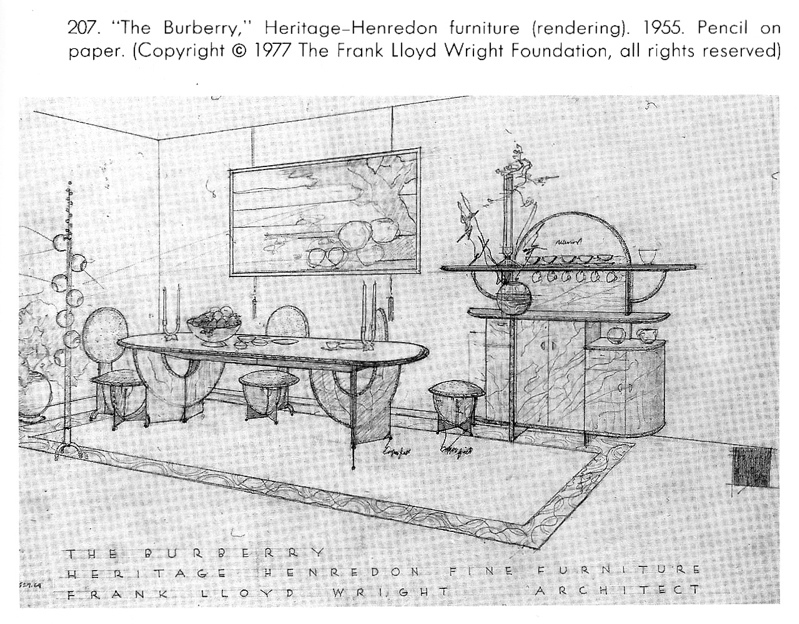 Who ever was involved-including Wright-some drawings of furniture groupings borderline on being comical. For what it's worth (there is some editorializing here) I'll add part of David Hanks' text on the H-H affair, and the drawings he reproduces in his book. Are these the drawings you mention, Jim ? They have obviously been "edited" in Wright's typical manner. . .
architectural device corresponding to the cantilevered roofs of his houses. 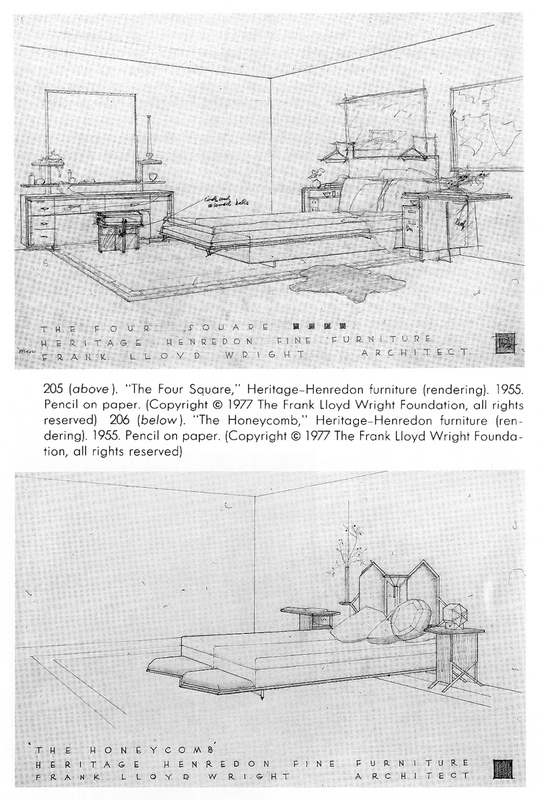 This idea was used earlier for the beds he designed for the Francis W.
August 11, 1977). According to Bruce Pfeiffer, it was Wright who dissolved the contract with Heritage-Henredon." Hanks claims that the ornamental molding used on "most of the Heritage furniture" had a earlier precedent in the furniture for the Husser and Bogk houses. The separation of the production (according to Hanks) into two related manufacturers, Heritage and Henredon, adds to the complexity of this study. That's them. I'm not home at the moment, but were they in the old "Drawings' book (with the Gordon Strong Automobile Objective on the cover)? I can understand why Henredon passed on them. As you say Stephan, the only "Wright" thing about the drawings are the embellishments-which had nothing to do with the furniture! The production line at least has redeeming design qualities. As far as those drawings go, if they weren't important for archival reasons, I'd burn 'em! Note that "The Honeycomb" does not appear to be signed in the red square. I wouldn't take responsibility either! These drawings, their captions, and the text above, are from David A Hanks' "The Decorative Designs of FLLW" (1979; Dover edition 1999). "the burberry" looks strangely moderne- art deco 20's-30's, for 1955. notice that even the coordinated landscape painting includes a multitude of circles. "the foursquare" grouping stands the test of time. Ah... that's where I saw it, I think I have a dog eared copy somewhere. I think they produced the Four-Square (not the Tall Back). I took a photo at Taliesin West and they had one similar to that.